Yes, some of these terms are a little simplified, but this is probably the neutral ground between getting too detailed and being practical. Loudspeaker specs come in all forms and they mean a whole range of things. This is a list of the most important and most common ones you should know. Remember that no spec by itself defines any loudspeaker, and no spec has the property of “the bigger/smaller the better” (this generally applies to more than just loudspeakers and hi-fi). Most of these details are just a property of design. Anyway. Ever wondered what those fancy terms mean? Well, here’s a basic explanation. Impedance is an electronic attribute of a loudspeaker. In layman’s terms, it’s how much a loudspeaker will resist the current output from amplifier. It is not simply resistance – it incorporates a complex function called reactance. They typically come in 4, 6 or 8 ohms. Impedance really means minimum impedance, which is achieved when the loudspeaker demands the most power. All other factors equal, the lower the impedance, the more power the speaker demands. You must match the capabilities of your amp to the requirements of the loudspeaker. Modern day amplifiers can usually handle speakers down to 4 ohms, but some are rated to 6 or 8 ohms. You can always use a higher impedance loudspeaker than the minimum rated impedance for an amp, but not vice versa. So if you purchase 4 ohm speakers, you shouldn’t use an amp rated at minimum 8 ohms. Like many attributes, impedance is a factor of design. The way a loudspeaker’s impedance is designed affects its sensitivity. The smaller the impedance, the more power the speaker demands, more current is required from the amplifier and therefore more sound per amplifier output. This may sound like an advantage, but it isn’t necessarily a good thing. A high impedance means less sensitivity, but if the impedance is too low, it means that the amp will need to work extra hard to cope with the loudspeaker’s demands. As a result this can be detrimental to sound quality. Remember, the impedance of the speaker is by no means a measure of quality. Both speakers and amps of all price ranges come in various impedance configurations. However you do need to make sure that the amp is suitable for your loudspeaker. For most beginner hi-fi consumers, the power rating of a loudspeaker is probably the most looked at, yet the least relevant specification. It is a completely pointless figure which realistically doesn’t mean anything for the average consumer. “Power” is just the maximum power a loudspeaker can theoretically handle without damage. In reality, loudspeakers rarely fail due to an over supply of power. You can read more about why power doesn’t matter here. Distortion typically means THD, which stands for Total Harmonic Distortion. Harmonic distortion is the distortion that occurs at the harmonics of the input signal, which is typically the most significant contribution to total distortion. Harmonic distortion occurs because the energy conversion system is not linear. At first, it sounds like THD is the only factor to consider for sound accuracy – it sounds like a simple expression of the percentage of sound which is distorted. However THD can be measured in many different ways (power or amplitude, band-limited or “white”). Adding to this, THD can occur in very different forms, and especially relevant is in the order and range of frequencies. Research has shown that first order distortion is much more “audible” than second order. Also distortion in frequencies away from those most sensitive to our ears (~1kHz) will be not nearly as evident to the listener. This means that 1% THD could “sound” much less distorted than 0.01% if the distortion occurred “favourably”. This is generally accepted as most evident in tube amps, where measured THD is typically >100 times greater than its solid state equivalent. People who want to buy “high wattage” speakers and want their speakers “loud”, should look to this as the most important factor. Sensitivity is a measure of how efficiently loudspeakers convert electric energy to sound. It’s typically expressed in dB/m/W. Because it’s expressed in dB, every 3 dB of sensitivity indicates the speaker to be twice as efficient. Given that most speakers range between 86 and 92dB, they can be easily an 8 fold difference in sensitivity. This is a factor that could make a 10W amp sound like 80W or vice versa. Ironically, it’s usually overlooked by those wanting “loud” speakers or just misunderstood. In engineering, frequency response is generally defined as the range of frequencies that a signal magnitude is constant. For loudspeakers, it’s the range of frequencies the sound remains equally loud. This definition isn’t even applied “stringently” in theory, as “constant” allows a 3dB drop off the sides. In real life, two adjacent frequencies will never have the same response. The main danger, however, in comparing frequency response is the magnitude of error it can generate with even a slight “fudging” of figures. Extending the cut-off point by an extra few dBs can completely change the response figures. And without the graph of the plot at hand, you would never know what it means. These factors render the figure quite useless. Even if we assume that frequency response is accurate, it ignores the entire other half of signal reproduction fidelity – phase. Frequency response deals only with amplitude. Our human ears perceive phase with as much or more importance than amplitude when it comes to sound “realism”. In a live music arena, amplitude is easily and significantly affected by things like seating position, reflections off walls, interference with objects, etc. However, we rarely notice this as detrimental to our experience. Phase, on the other hand, corrupts our perception of direction. This makes a live experience sound like a recorded one. 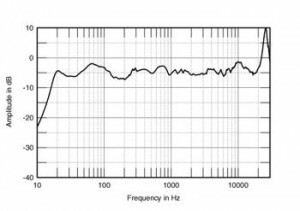 While it is nearly impossible for any loudspeaker manufacturer to provide any meaningful figures with phase, it needs to be noted that frequency response is only a small fraction of the complete story. “Baffle” refers to the mass either side of the diaphragm (the cone of the loudspeaker). When the loudspeaker was first invented, it stood alone and effectively had an infinite mass of air on either side (this is called “open” or “infinite” baffle). As the technology improved, people realised that a higher gain (increased sensitivity), as well as better frequency response could be achieved by enclosing one or more sides of the diaphragm in a fixed volume of air – that is, in a box. Additionally, two or more diaphragms could be put in the same box to work together to improve the response. And adding even more complexity is the use of pipes or “ports” to make ported loudspeakers, which have two resonant frequencies. This helps to extend response range, typically in the lower frequencies. There are hundreds of various ways of designing the basic structure of a loudspeaker. It would require a book or two just to explain any of them in detail, however I will try to briefly describe the properties of the most common terms. Sealed loudspeakers are the simplest and one of the most common types of enclosures. It’s just a diaphragm and a box. The air is fully enclosed and cannot escape, forming a spring for the diaphragm to “bounce” off. Simple doesn’t mean cheap, though. Sealed enclosures are used from the most basic to some of the most expensive models. Ported loudspeakers are a speaker with a hole somewhere on the enclosure. The hole is not just an opening but a usually a circular pipe. A pipe introduces another factor of resonance which can help in extending the frequency range. It has, therefore, the properties of a sealed enclosure with the addition of some extra range. But sometimes this may be at the detriment of the clarity. Ported speakers are the most commonly made. 2 way means that there two groups of drivers working together to achieve the full sound. Typically, this means 1 x tweeter and 1 x woofer or 1 x tweeter and 2 x woofers. Same as above, but one extra group, usually 1 x tweeter, 1 x mid-woofer and 1 x woofer. The source of how the speaker components are working together comes from the internal electronic configuration. A sound signal will contain many frequencies, however it is nearly impossible to design a driver which can handle all frequencies well. Usually they are configured to handle a range of frequencies as described above. A woofer, for example, will handle the mid to low range, and a tweeter the mid to high range. The electronics which divides up the signals and controls the transition between the frequency boundaries are called the crossovers. And there you have it! A brief overview on the most common loudspeaker specifications. We’ll keep adding to this page as more questions come about. To ask us a question, click to contact us. This entry was posted on December 15, 2009, 8:54 pm and is filed under Articles. You can follow any responses to this entry through RSS 2.0. You can leave a response, or trackback from your own site.